Not much to report on the home front here.... added a new baby hedgehog to the family, but still have LOTS of WIP. 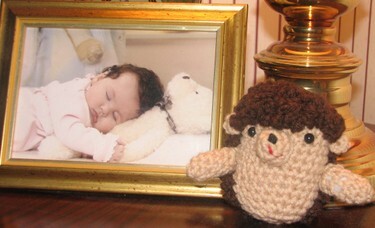 The picture is a photo of Emma around March/April 2002. She actually fell asleep at the photo shoot on top of the teddy bear. I just told the photographer to shoot away. We are starting to thaw out here. We were supposed to get around 6-8 inches of snow, instead it warmed up to 36 and it rained, and rained, and rained. I had really hoped for snow. Something we could all go play in. So I kind of cried on the inside while it rained. Just wanted to say Hi! I am your swap partner for the brooch swap. I've really enjoyed checking out your blog. I've been brain storming a couple brooch ideas, can you tell me a little about your style? Boo! I would've cried too. At least there's a super cute baby pic for consolation. Oh -- and tag! You're it! That hedgehog is so gorgeous!! Oh my goodness, I long to have the talent to make things like that.